You love to climb on everything! You are fearless and while it freaks out daddy and I, we are happy that you have such a unique spirit, it's amazing. You tell us that you are hungry, not only by signing and vocalizing, but also, climbing up your high chair, sitting expectantly for food. You LOVE to show affection, giving tight hugs, besitos, blowing kisses, and high fives. I dreamed of the day when you'd openly reciprocate or initiate and that day has come. 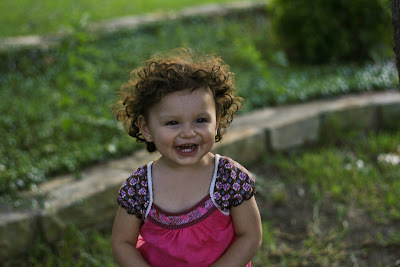 I can't describe the joy I have at the end of a long day when you run towards me, arms outstretched, hollering mamama. You love to play with volleyballs and basketballs, rolling, throwing, kicking, and you understand when we want you to pass it to us. You enjoy dancing, dancing, dancing. Girl, you work the floor! You've had some allergies and stuffiness, and you've learned how to blow your nose. You also like to wash yourself and help us change your diaper. You started off fast wanting to learn how to potty train, and ever since then, you're more interested in flushing the toilet than going on it. Your palate is so complex, you can discern the taste between over-salted food and poor wine, simply with your smell. You still adore your dragon book, you adore the computer, and turning the tv on and off. You help around the house by bringing clothes to me when I'm doing laundry, letting Guapo out of his cage, and trying to help with dishes. You're getting much better about pausing for prayer and in church, you love to hurry up to the basket on the altar, and drop your envelope in the basket. The biggest thing you've learned is empathy. You tenderly heal when someone isn't feeling well. You comfort when someone is sad. and Your beautiful smile is infectious, that laugh of yours uplifting, it brightens ANY mood! You are such an amazing little girl and your daddy and I are so blessed to have you in our lives. Thank you for choosing us to be your parents! It's an adventure everyday and I wouldn't have it any other way.